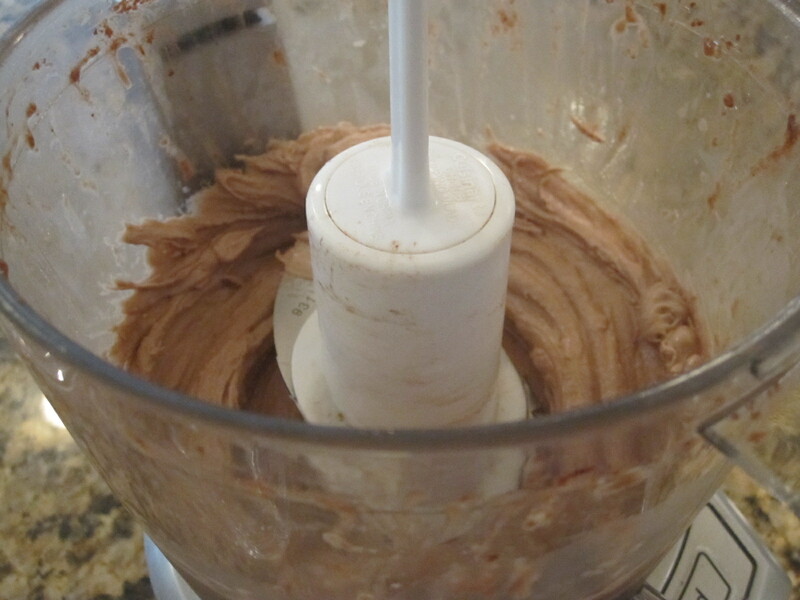 The next morning, combine 1 frozen banana, 1 tsp cocoa powder, and ginger to taste in a food processor. Layer in a glass or bowl. Top with whatever you fancy! 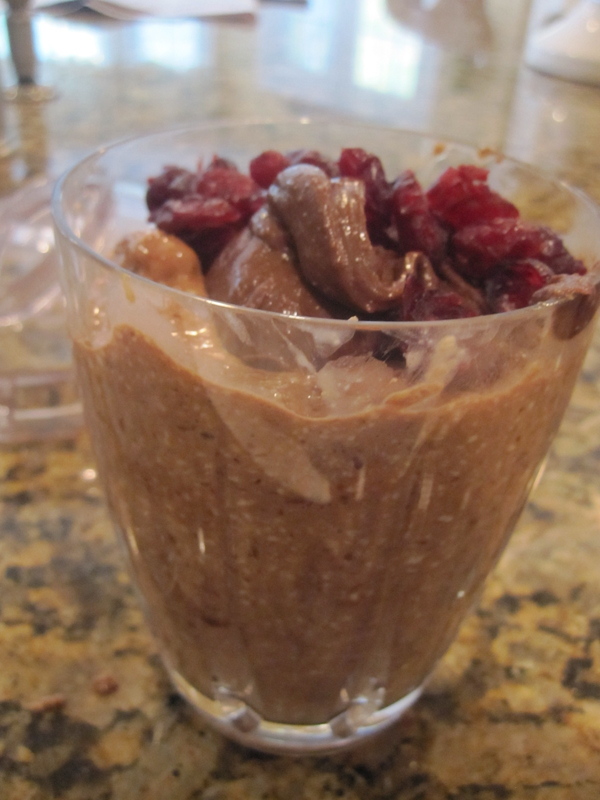 I topped mine with dried cranberries and a scoop of Dark Chocolate Dreams Peanut Butter. 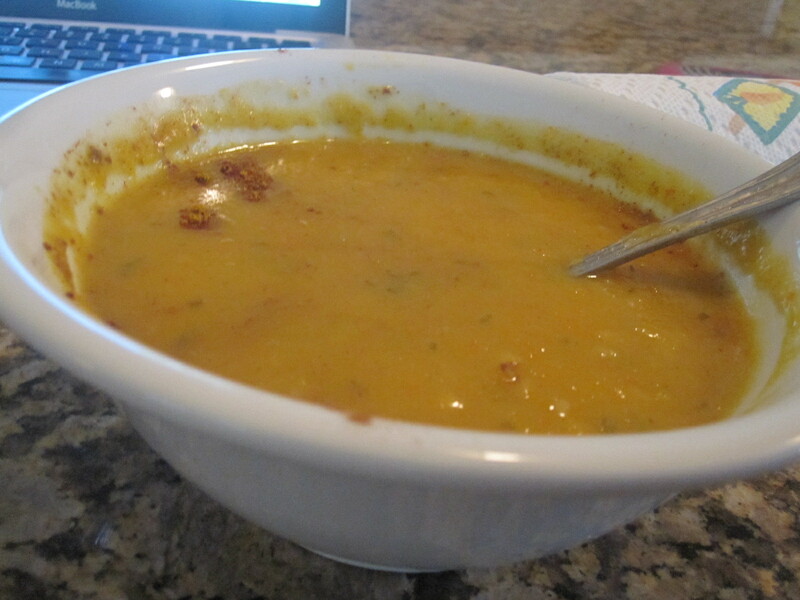 Soup is quickly turning into my go-to, even when I’m not having a flareup! 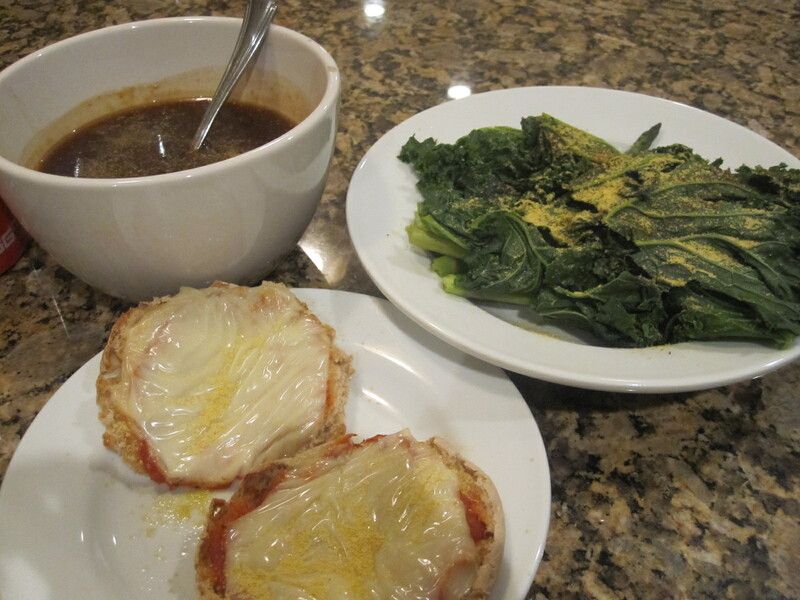 I am seriously loving that Baxter’s French Onion Soup. On the side: asparagus, kale, and an English Muffin Pizza! These are one of my favorite things to eat. However, I used a lactose-free ‘cheeze’ i hadn’t used before and oh boy. It became a solid mess on top and creamy on the bottom. It tasted good, but the top reminded me of processed maple syrup at a diner: all right in a pinch, but nothing like the real thing. 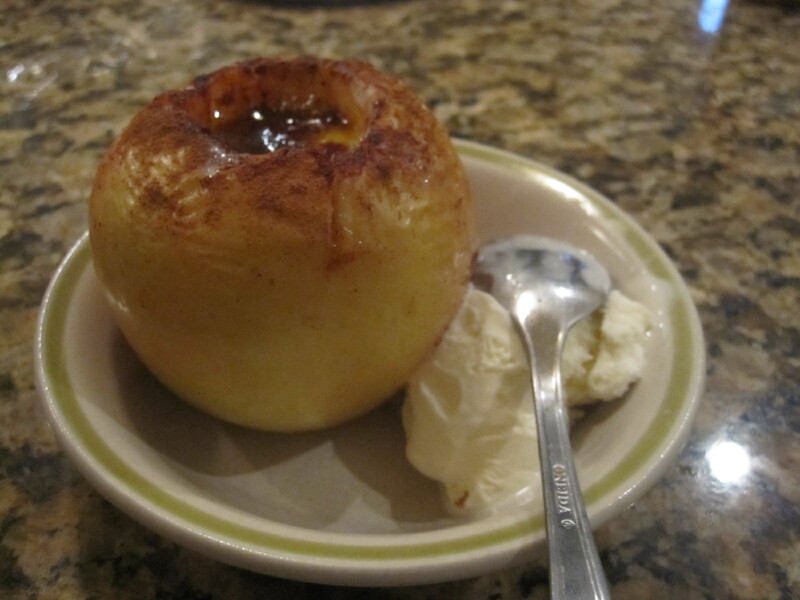 For dessert, I baked a Honeycrisp apple for about 20 minutes. Inside? 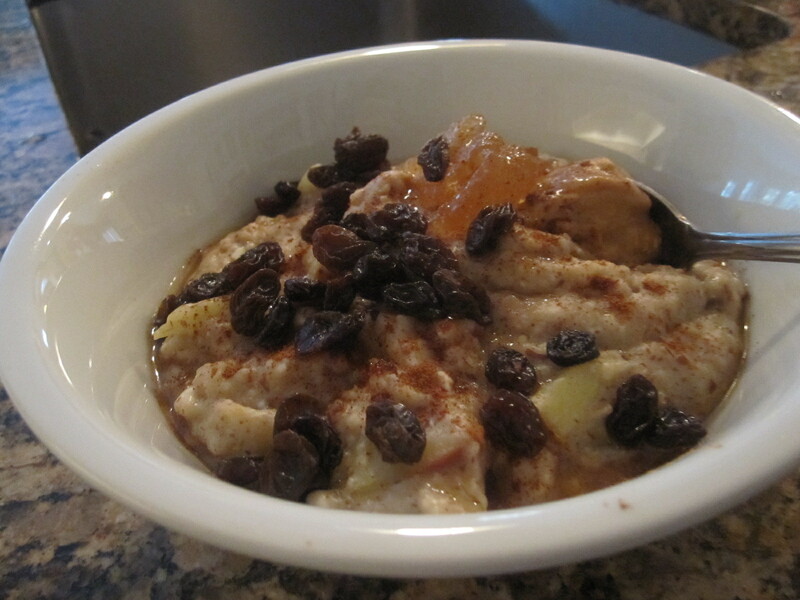 Some Smart Balance, a bit of apple butter, and a ton of cinnamon and stevia. It came out delicious, if a bit hard still. Nothing a little bit of frozen yogurt can’t fix. 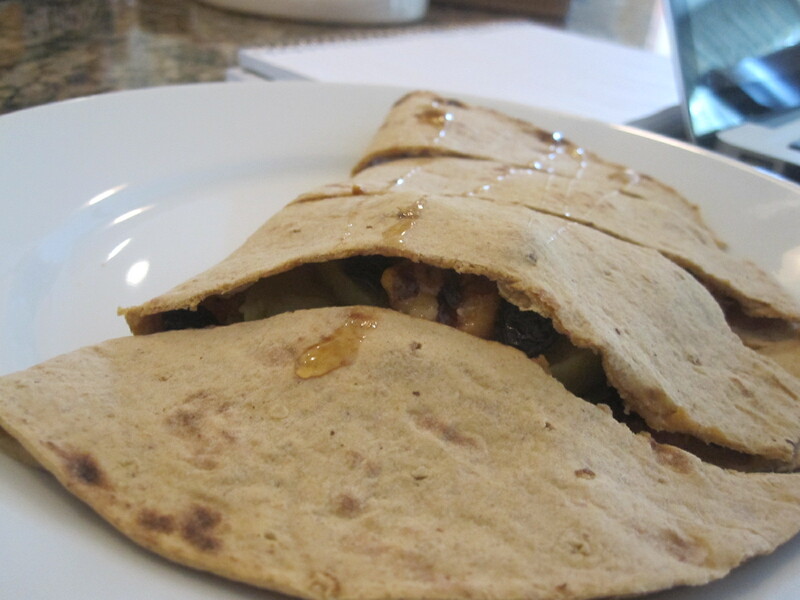 I used a Crispin apple for my next adventure in sandwich-making…this is a Flatout wrap stuffed with 1/2 a Crispin, 1 tablespoon Trader Joe’s Flaxseed Peanut Butter, 1 tbsp raisins, and 1 tbsp glazed walnuts. That was the finishing touch that put this thing over the edge. 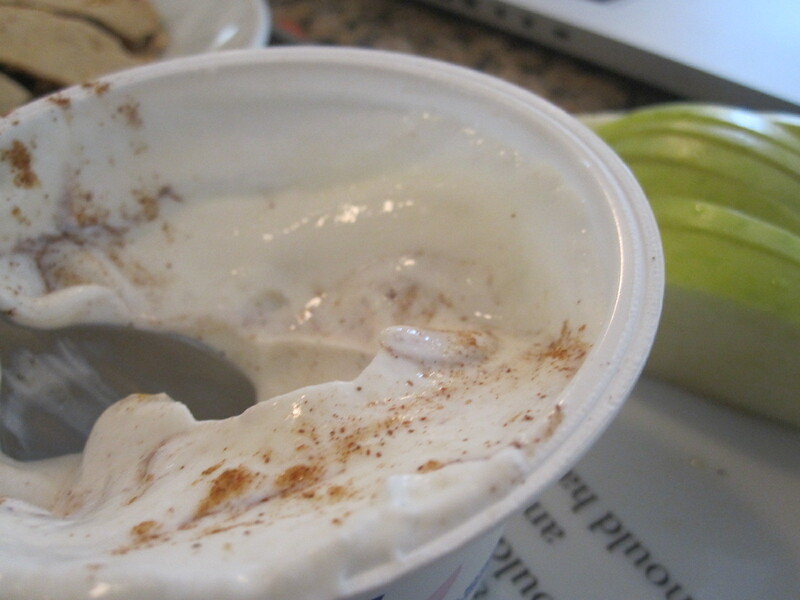 On the side, the rest of the Crispin dipped with a Fage yogurt smothered in cinnamon. 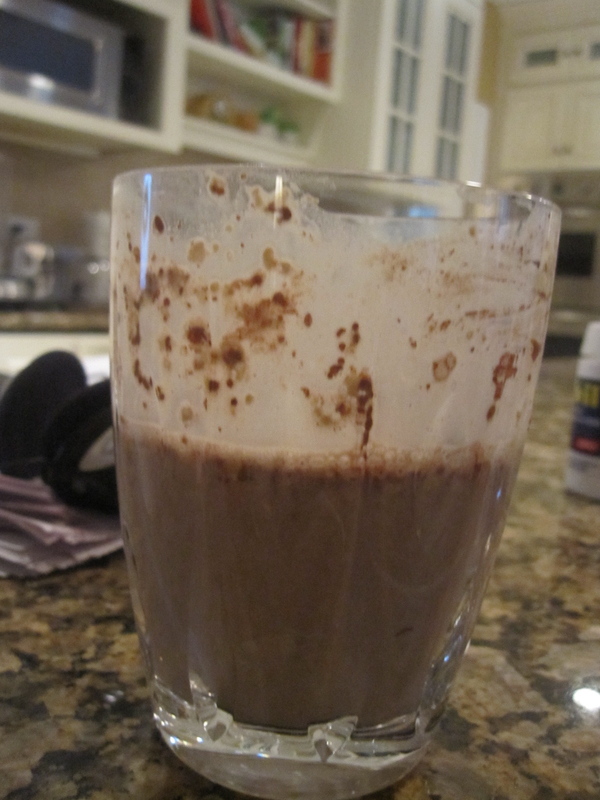 Post-run, pre-yoga snack was an AWESOME protein shake. 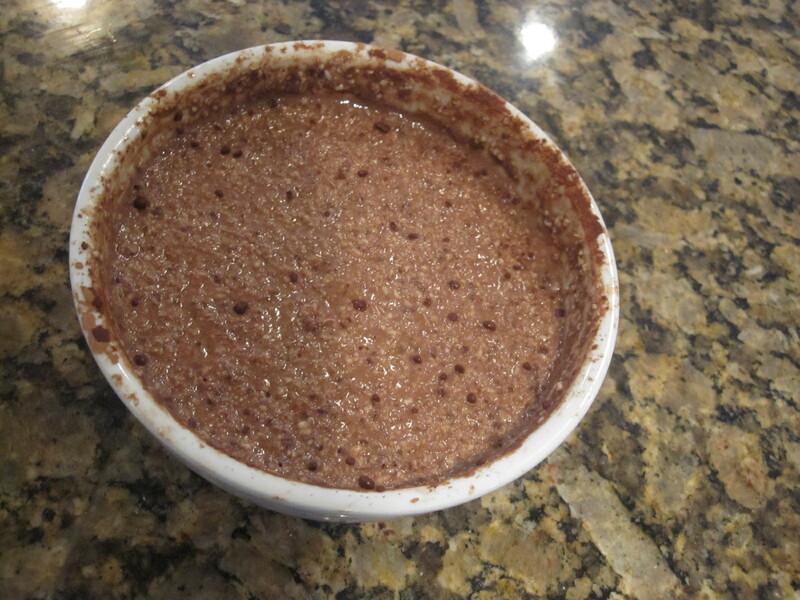 I mixed a cup of coconut milk with 1 scoop protein powder, 1 tsp Hershey syrup, 1 tbsp cocoa powder, stevia, and pumpkin pie spice. Absolutely awesome, although I wish I’d put it in the blender. 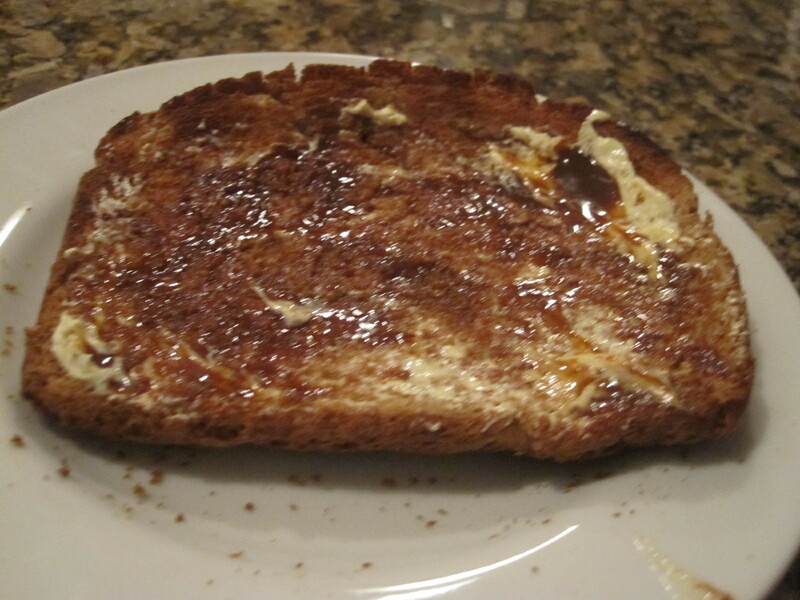 I enjoyed a big bowl (with several re-dips of my spoon into the pot) along with an endpiece of Pepperidge Farms Honey Oat bread, toasted and slathered with Marmite and Smart Balance. I am addicted to the Swiss Miss Diet Cocoa packs. I use two. Shh. This morning I used some more of that fabulous TJ’s peanut butter in my oatmeal. I combined half a Crispin with Scottish oats, an egg white, and flax meal and stirred it all up until it got hot and puffy. I then topped it with raisins, the PB, apple cinnamon jelly, and a bit of maple syrup. 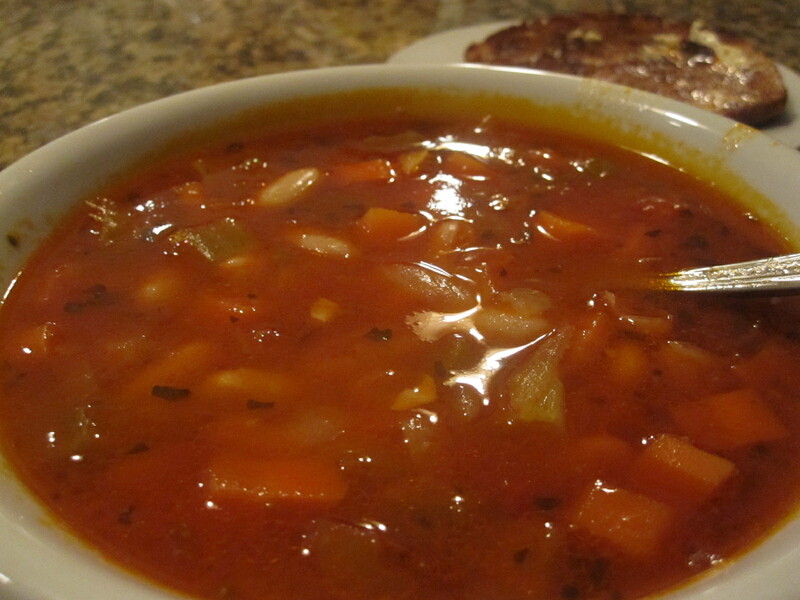 It was FREEZING today in CT, so soup once again was on my mind. This is my old fave: V8 Butternut Squash. Absolutely awesome, and made even better with cinnamon and curry powder thrown in! The main event? 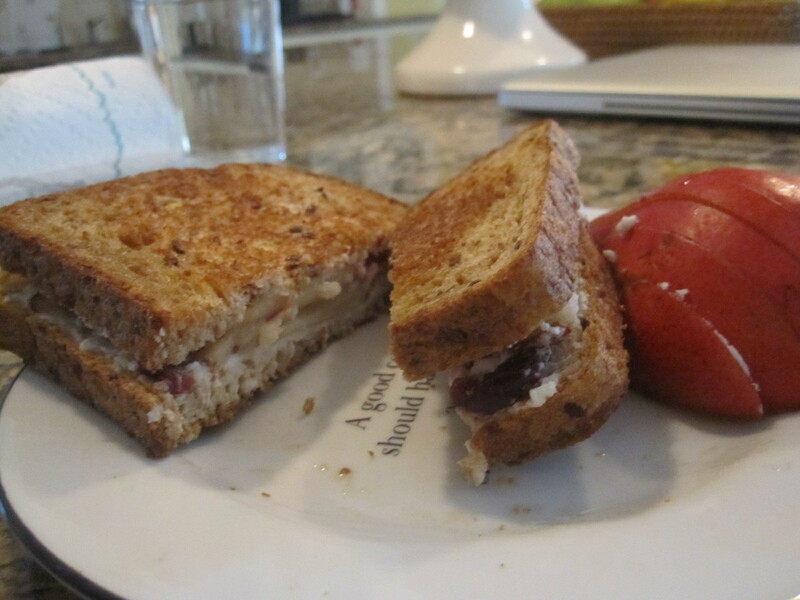 A goat cheese and pear sandwich. With the rest of the pear on the side. Waste not. This afternoon I ate several handfuls of grapes while I studied, and I also made Mama Pea’s Vegan Pumpkin Spice Latte, but decaf and with only 1/2 cup of almond milk as I didn’t want to use up the rest of it. SO GOOD. Too good. I scarfed it down before taking a pic. All of that coffee did not bode well for me at the gym. I was sucking down water like a fiend! I couldn’t get it into my system fast enough. I did manage to get about 40 minutes on the elliptical, along with about 20 minutes of strength training. I usually just leave it up to yoga to keep me toned, but I could tell I was missing something. I was glad I did it, as I’ve missed my weights! After a quick stop at Best Buy to stock up on some DVDs (I’ve fallen in love with Community! ), it was time for dinner! My mom threw a baked potato in the microwave while I chopped up tofu that had been pressing on my counter for a few hours. 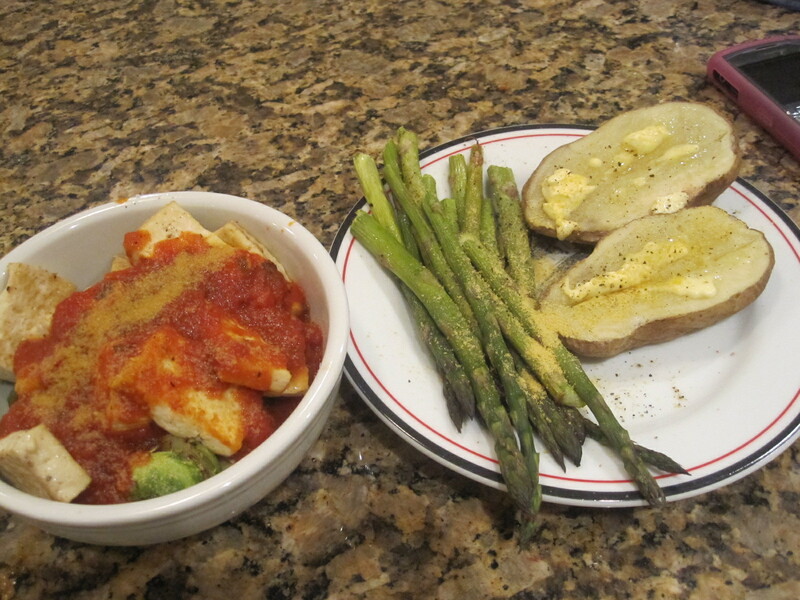 I baked it in the oven along with asparagus and brussels sprouts, then topped the whole mess with marinara. When the potato came out, I topped that with Smart Balance. 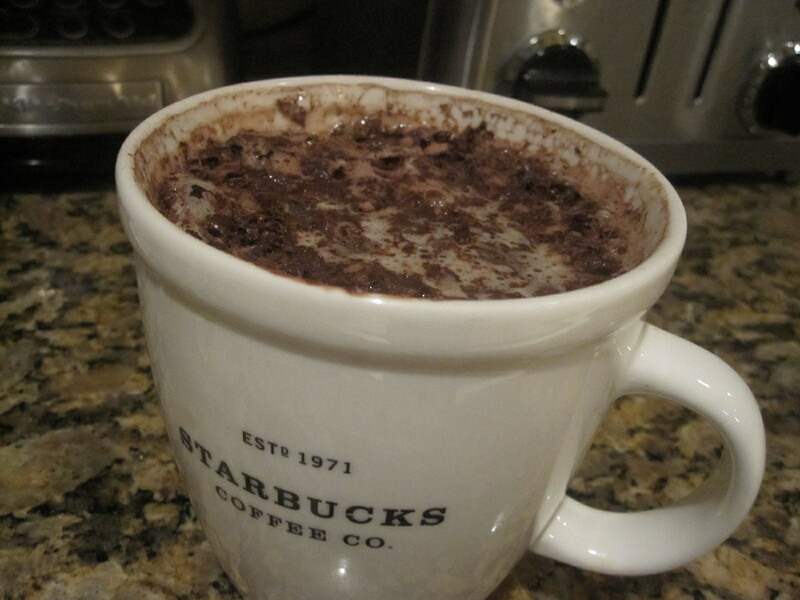 Then….NOM. I think I’ve unintentionally eaten vegetarian for the last three days. Crazy! And it’s shocking, but a few times I’ve seen turkey slices sitting in my fridge and bypassed them for another sandwich. Maybe I’m more vegan than I realized? I can’t go totally vegan. I wouldn’t be able to eat this. 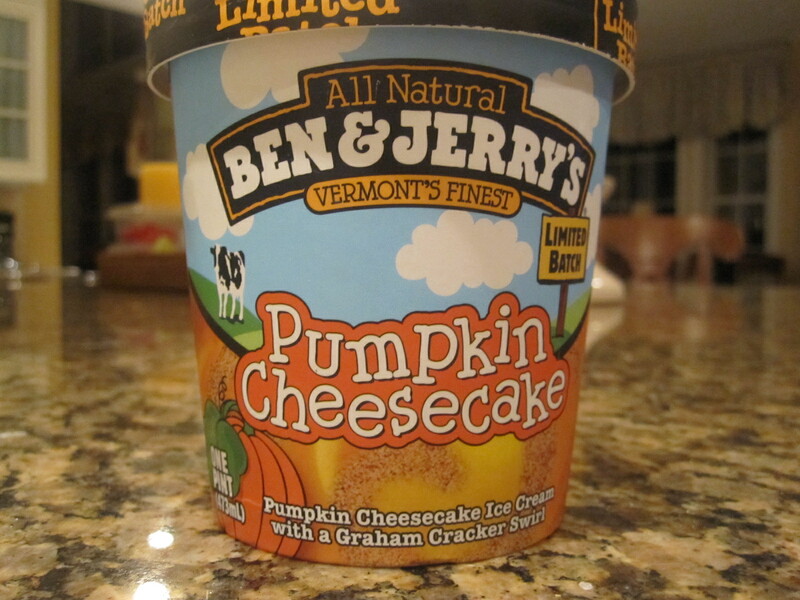 I first heard about this Limited Batch a few weeks ago, when trolling Ben and Jerry’s for holiday flavors. I was stunned when I thought they didn’t make any pumpkin flavors, overjoyed when I discovered they DID, but saddened when I realized they probably wouldn’t sell it in my grocery store. Lo and behold! Let’s just say I will be hiding this from my Dad. He’s a Ben and Jerry’s freak, too. Sadly, I can’t eat a lot of this at a time…full fat dairy wreaks havoc on my gut. 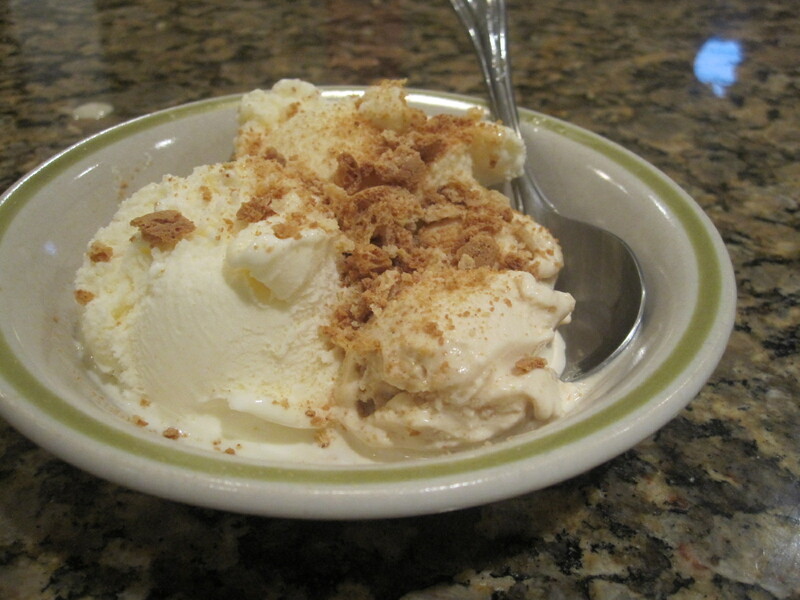 However, I did manage to have two tablespoons alongside a normal serving of frozen yogurt, and a crumbled amaretti cookie on top. This was actually a really smart move, as this stuff is AMAZING but really sweet. A little bite was more than enough! It even flavored the yogurt as it started to melt. Now, off to bed I go! Got a busy day of studying and teaching ahead!